Do you love red, white and blue? So do I and I wasn't ready to stop using it just because the Fourth of July celebrations were over! 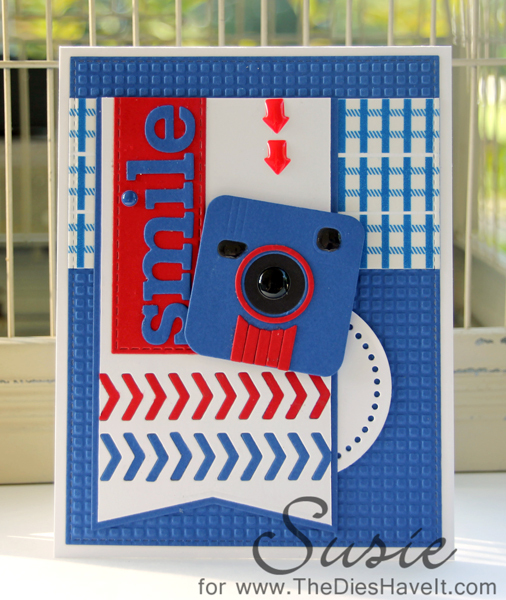 All of the die cuts on my card (except one) are from MFT Stamps. The one exception is that little circle with the cut out dots - it's from Little B.
I had big fun making this card. I love all the layers. It's the kind of card that takes a while, but it's worth it. I thought it fit perfectly for The Cutting Edge Challenge this week. The banner and the inlaid chevrons fit the bill to a T. This is my first time doing their challenge...but it won't be the last for sure! This is too cute for words! And, YES, I love red, white & blue - year round! LOL Thanks so much for playing with us at the Cutting Edge Challenge - we're so glad you did!